So easy to prepare, this comfort-food supper is sure to become a weeknight staple. Mix flour and pepper in shallow dish. Add chicken; turn to evenly coat both sides of each breast. Gently shake off excess flour mixture. Heat dressing in large nonstick skillet on medium heat. Add chicken, meat-sides down; cook 5 to 6 min. or until golden brown. Turn chicken. Add carrots, onions and 1 cup broth; cover. Simmer on medium-low heat 20 min. or until carrots are tender and chicken is done (170°F). Meanwhile, cook rice as directed on package, omitting salt. Spoon rice onto platter. Use slotted spoon to remove chicken and vegetables from skillet, reserving liquid in skillet. Place chicken and vegetables over rice; cover to keep warm. Add cream cheese product and remaining broth to skillet; cook and stir on high heat 2 to 3 min. or until cream cheese is melted and sauce is well blended. Simmer on medium-low heat 3 to 5 min. or until sauce is slightly thickened, stirring occasionally. 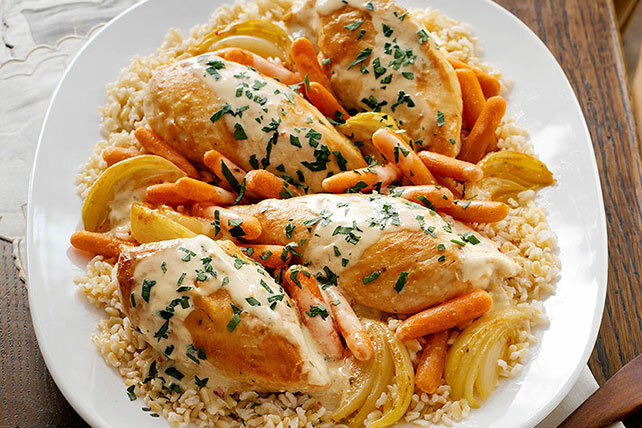 Spoon over chicken and vegetables; sprinkle with parsley. Substitute bone-in chicken thighs with skin removed for the chicken breasts.